The following MOU was published on the website of the Australian Defence Science and Technology Office. • seeking to make the best use of their countries’ respective science and innovation capabilities, to eliminate unnecessary duplication of work and to obtain the most efficient and cost-effective results through cooperation in joint research activities; have decided to facilitate bilateral cooperation in national security and counter-terrorism science and innovation by means of this Memorandum of Understanding. 1.2 The Signatories acknowledge that this Memorandum of Understanding is not legally binding on the Signatories or Participants. Notwithstanding this, each Signatory intends to implement this Memorandum of Understanding in accordance with its international legal obligations. 3.1.2 the practical application of engineering and scientific knowledge. 3.2.9 the development and implementation of threat and vulnerability assessments. 3.3 In addition, the Signatories will keep each other informed about their national research and development plans which are relevant to the objectives of this Memorandum of Understanding set out at paragraphs 3.1 and 3.2 above, with a view to identifying potential areas for further collaboration. The Signatories will examine whether and to what extent collaboration can occur on investment in research and development, including trials. 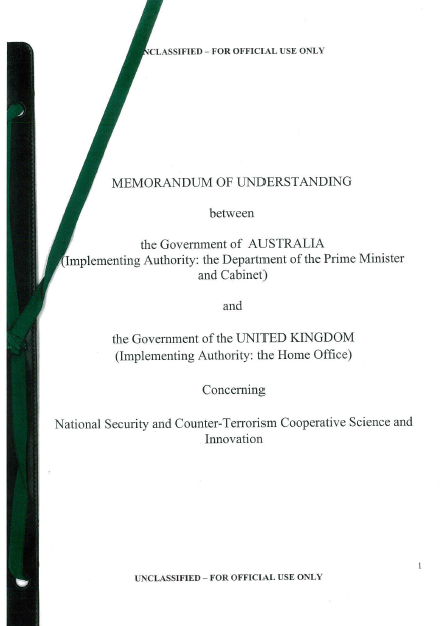 3.4 The Signatories will investigate how their national research and technology projects, which are relevant to the objectives of this Memorandum of Understanding set out at paragraphs 3.1 and 3.2 above, including the use of facilities, can be more effectively coordinated to reduce duplication of effort and to facilitate the free exchange of information. and other forms of cooperation for achieving the objectives of this Memorandum of Understanding, as may be mutually arranged by Participants. 3.6 Information exchange will take place between Participants on an equitable, balanced and reciprocal basis. Subject to compliance with Participants’ respective national laws, policies and regulations and relevant paragraphs of this Memorandum of Understanding, this Memorandum of Understanding provides for the exchange of Information which is relevant to the objectives of this Memorandum of Understanding set out at paragraphs 3.1 and 3.2 above for the purpose of harmonising the Signatories’ and Participants’ respective science and technology requirements and for formulating, developing and negotiating Annexes to this Memorandum of Understanding.